For the last in the series both for this month as well as this week's theme of cooking from my paired blogger - Sandhya - I chanced upon these Energy bars which she had made recently. 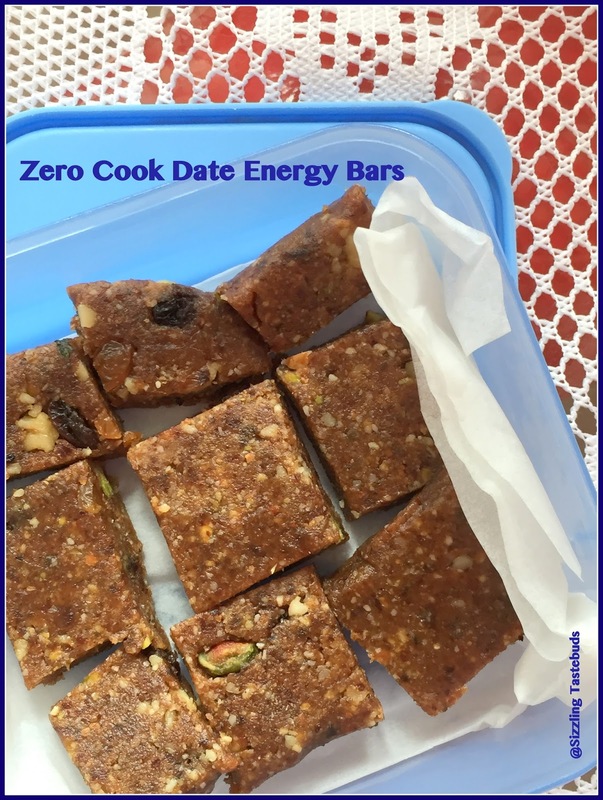 A great snack to have between meals or for the kids when they come back from school or any outdoor activity. I had made something else for today from my blog, but I had to make it for the kids. 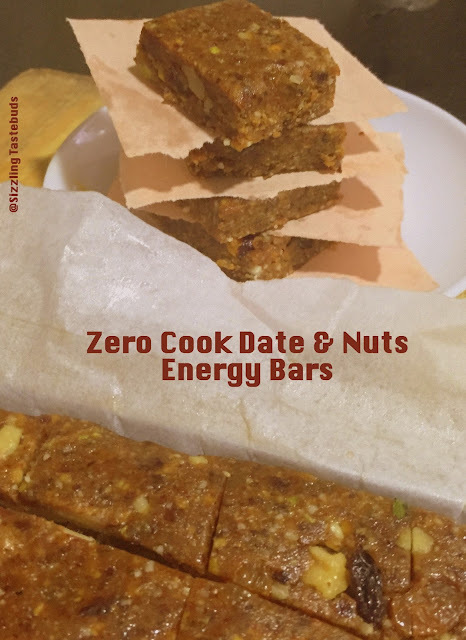 We all liked it for 4 major reasons : it was sugarfree, zero cook, nutty and healthy. If you still need a reason to make this, scroll down to the recipe below. Sending this to BM # 53 under bookmarked recipes. 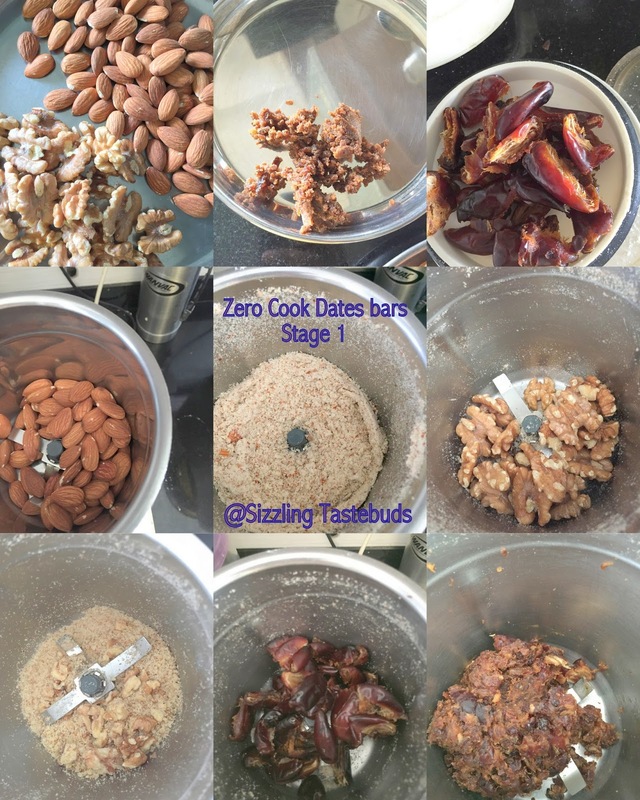 Roast the almonds, walnuts separately (microwave for 30-45 seconds) & cool. This step is optional but recommended. Lightly pulse them separately in dashes for 3-4 seconds till they are coarsely powdered but still have a bite. Deseed the dates and pulse the amla (if using) lightly for 5 -6 seconds. chop the anjeer / figs into small bits. Now without adding any water puree the dates and amla into a coarse paste (if you have a food processor, you can process all ingredients at one go, but as I was using my mixer grinder, I had to add the wet / sticky ingredients & dry separately. Whichever appliance you are using, be sure to scrape down after every pulse - dont grind). Now add the powdered almonds and walnuts and pulse once more to mix more (you dont want the almond to become butter so do it in spurts). Using a plastic spatula, mix the dry and mix several times. Now add the raisins, figs and give it a vigorous blitz. mix well til the oil from all the dry fruits mix and give you a good mass to work with. Transfer the semi wet mass onto a lightly greased parchment and roll with a rolling pin as shown in the pics. Make a thickish square, seal the parchment well and place in a refrigerator for a day or two (I placed it for 18-20 hours). Cut into squares and serve. It keeps well for over a week under refrigeration. 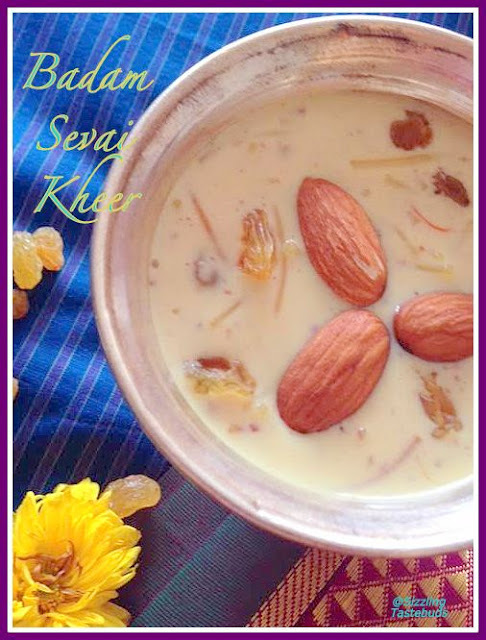 After Palak Raita, its time for another recipe referenced from Sandhya's blog - my paired blogger for this week. Most of her South Indian recipes are similar to the way we make it (considering we are both South Indians), one particular recipe Red pumpkin Sabji caught my attention for its sheer simplicity and except for the onions and tomatoes, we make it similarly with the addition of ginger though in a South Indian Style. Like Sandhya, it too is one of my favourite sabjis to go with a roti and some salad / dal for our weekday dinner. Thankfully both the girls like it too. 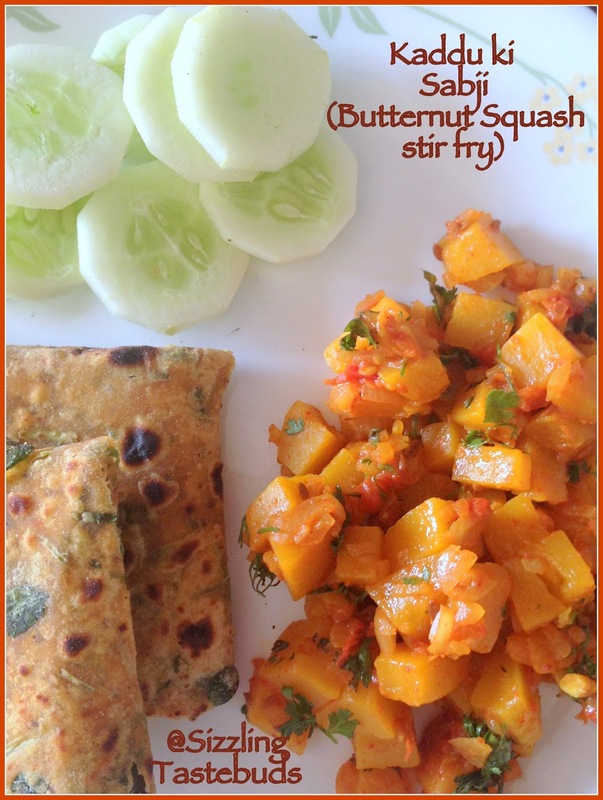 If you grow squash in your backyard like Sandhya, or have access to it all the year through , do give this recipe a shot. Sending this to BM#53 under bookmarked recipes. Note : we love this sabji to have a bite and retain the form so I steam it for 8-9 mins. But if you want to cook through till fork tender, please do so. 1) Clean, cube squash into medium sized chunks. Steam for 8-9 mins till done but not mushy. 2) In a pan, heat oil, add the tempering, grated ginger & turmeric, once the mustard stops spluttering, add the steamed veggies and very lightly toss them around, taking care not to break them. 3) Now add salt, chilli powder and toss once more, check for spice. 4) Switch off, add coriander and coconut if using and gently mix, Serve immediately with Rice or Roti. As part of the Blogging Marathon, we occasionally get paired with a co-blogger where we need to pick and cook dishes from their blog. Paired with Sandhya of My Cooking Journey this time, it was a gastronomical delight - her bakes to South Indian Cooking to Salads - most dishes caught my attention. It was interesting to see so many many breads on her blog, and I wish I could bake all of them.. someday soon .. Till then, 3 dishes for this week chosen and recreated from her blog. First of them is a simple and yummy Raita (or Pachadi) with Palak (Spinach). We include Raithas almost thrice a week with any ingredient like Mint / Bell Pepper/ Eggplant / Pineapple/ Snakegourd (Podalangai)/ Radish (Mooli) / Potato and the kids like them a lot. 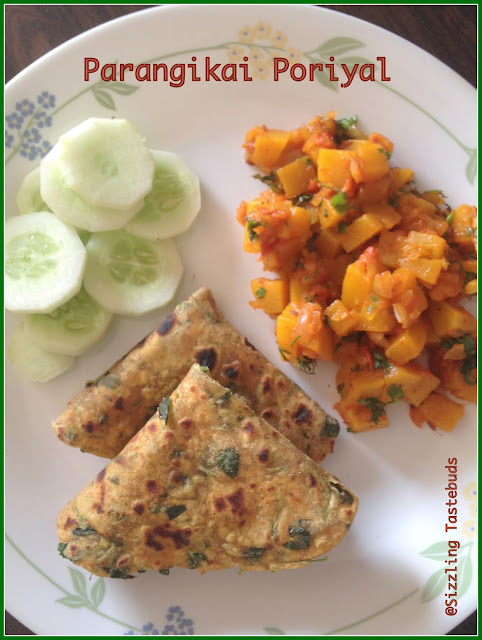 Apart from providing calcium through yoghurt, palak in this dish adds a dimension of folic acid and was very yummy. 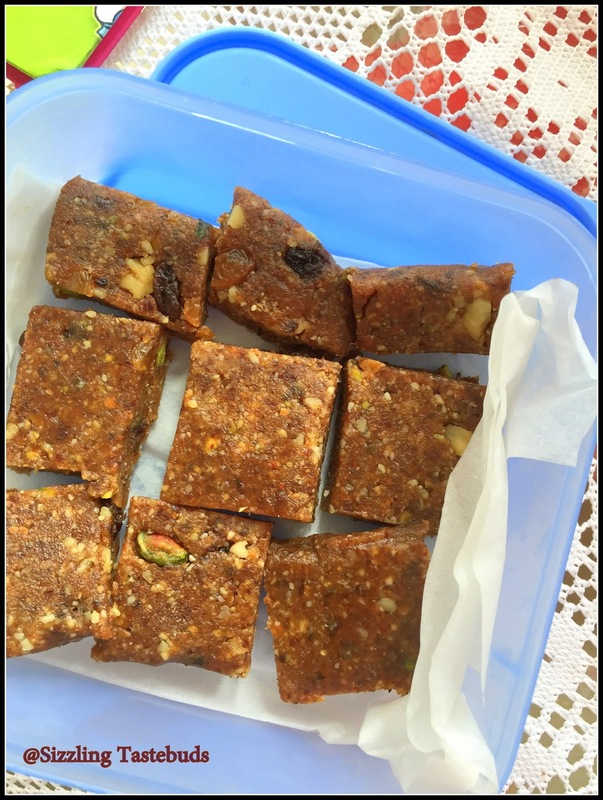 For spinach lovers, this is a treat, thank you Sandhya, we tried this out and liked it a lot and am sure it would appear regularly on our menu. Tempering : Mustard seeds, Jeera (Cumin), Asafoetida, Green Chillies, red chillies. 1) Chop the cleaned and drained spinach into fine shreds. In a pan, heat oil. Splutter the tempering ingredients, once the mustard settles down and the jeera turns slightly brown, add the shredded spinach and lightly saute. 2) Add a pinch of salt and sprinkle very little water and close immeidately. Let it cook in the steam for 5-7 minutes. Let all the water evaporate from the shriveled Spinach. Cool thoroughly. 3) Now whisk the yoghurt with requisite salt (you can add salt later if you are not serving this immediately). Add the sauteed spinach and mix well. Serve immediately. Nuts and dry fruits are an integral part of our snack and both kids like it. Sometimes the husband (as all husbands, I think, who love to shop) goes a little overboard with buying these. So, I am literally left with a lot of nuts, and that’s not a nutty feeling J I do end up making pesto sometimes or the microwaved spiced nuts or add them to Ladoos. 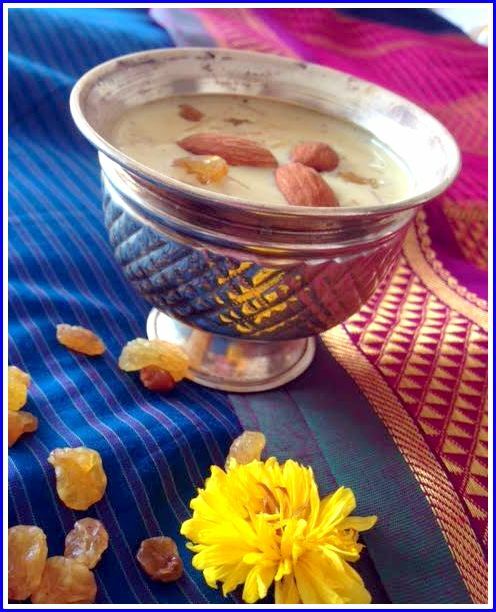 The elder one celebrated her birthday recently, and keeping in with a subdued celebration (according to her, a bigger party was in order) a Kheer was made for the morning before we went to the temple. So made this for a quick sweet treat to end the meal on her birthday. 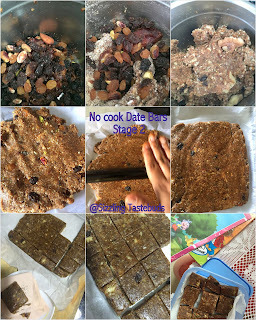 As promised in this week’s theme on BM : just 3 ingredients (excluding salt, sugar, oil) and you have a wonderful treat. 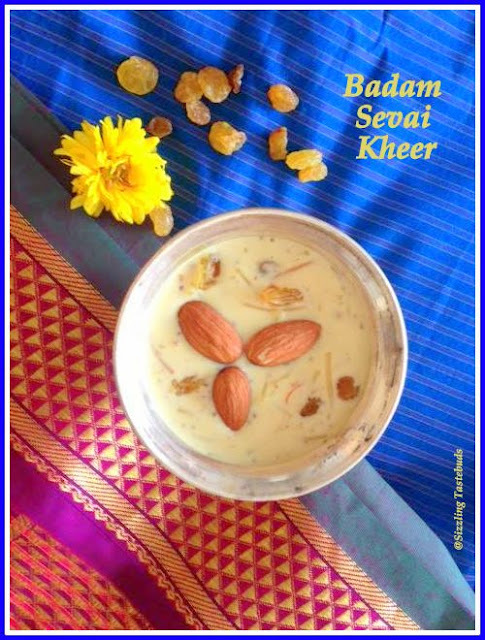 Hope you enjoyed the series with Amrud ka Panha, Morkali and today’s Badam Sevai Kheer. Shelf life: Can be stored in the refrigerator up to 3 days : Micro the required quantity only for 15-20 seconds before use if consuming on the subsequent days. In a pan, add the ghee and the roasted vermicelli. Sauté for 1 min, add ½ cup of water and close and cook for 8-10 mins till fully done. Now Add the condensed milk, almond meal and mix well. Keep stirring till you get the required consistency. Serve warm or cold or at room temperature.